Last week, I highlighted that since '00, when the Federal Reserve has ceased adding to its balance sheet or begun "normalizing" (via rolling off assets), equity markets have swooned (detailed HERE). A simple idea today... that the end of population growth (where it matters) has long been upon us (detailed below). Absent population growth among the nations that do nearly all the consuming, a debt based economic and financial system (to coerce ever higher levels of debt fueled consumption) can't ultimately succeed. That is, without population growth, assets generally don't appreciate, homes are just shelter rather than "investments", and debt is generally only a drag on future spending. Likewise, without population growth, total global energy consumption is on the precipice of secular decline (detailed HERE). However, the distribution of those births among the differing groupings of nations (by income) has dramatically changed from 1950 to present...and will shift further by 2050. The chart below shows both total births but also the proportion of births among the high income, upper middle income nations, and China have nearly fallen in half since 1950...while the proportion of births among the lower middle and low income nations have soared. More simply put, births among those that consume heavily (about 90% of total global energy) have long since collapsed while births among those who consume relatively little (just over 10%) have soared. High income nations births (blue line) and year over year change (red columns). Incomes range from $90k to $12k, per capita, and these nations (US/Can, EU, Japan/S. Korea, Aus/NZ, etc.) consume 47% of total global energy. Births have fallen <19%> since the 1961 peak but are anticipated to remain about here indefinitely (little to no growth) thanks to anticipated immigration making up for the negative birth rates. Upper middle income nations annual births (blue line) and year over year change (red column). Incomes range from $12k to $4k, per capita, and these nations including Russia, Brazil, Mexico, etc. consume 18% of total global energy. Cumulative births among these nations have fallen <12%> since the 1987 peak and only expected to continue declining. China annual births before (blue line) and since the late 2015 revision to the 2 child policy (green dashed line), plus year over year change (red columns, chart below). China has ramped is consumption of global energy to 24% while births have fallen <46%> since the 1989 peak?!? 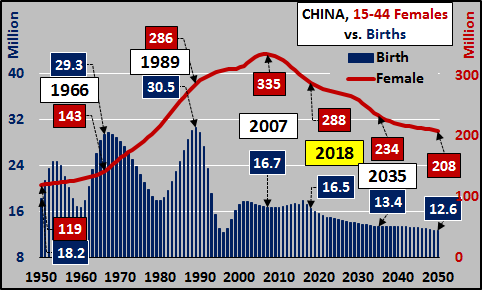 Of course, the collapse in Chinese births almost 25 years ago means a like collapse in demand is now taking hold as this significantly smaller "new normal" population enters adulthood. Economically, watch out below as domestic demand falls away. Lower middle income nations annual births (blue line) and year over year change (red columns). These nations have incomes of $4k to $1k, per capita, including India, Pakistan, Nigeria, Vietnam, etc. and represent about 3.1 billion persons. While births are still increasing, the year over year growth in births has decelerated over 90% and expected to flat line indefinitely from here among these nations that consume about 11% of global energy. Low income nations annual births (blue line) and year over year change (red columns). These nations, representing about 700 million persons including most of Sub-Saharan Africa, have incomes under $1k, per capita, and consume less than 1% of global energy. While births are still growing, year over year growth has been flat since 2000 and decelerating growth is anticipated from here on. 2- China is the epic-center of population decline. The chart below shows China's 15 to 44 year old female childbearing population versus Chinese births. Not only have births fallen <46%> but this decline has worked its way in those of childbearing age. The 15 to 44 year old Chinese female population is not only about 25 million fewer than the same male population in China, it is also down <14%> (-47 million) from the 2007 peak. By 2035, the same group will be <30%> smaller (-101 million). A collapsing childbearing population with negative birthrates has the potential for significantly lower births than shown below. Widening out to view the childbearing population versus births of the high and upper middle income nations (including China), we can see in the chart below that births (blue columns) peaked almost fifty years ago and only continue falling. 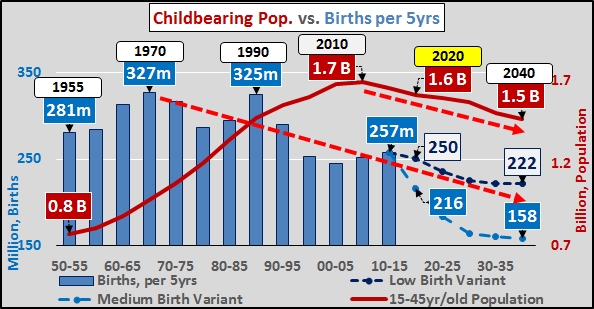 Logically, it follows that eventually the childbearing population (red line) would likewise peak, as it did around 2010, and begin its indefinite decline. The economic, financial, and even environmental impacts of a self-reinforcing decline of the childbearing populace with negative birthrates among them should be pretty obvious. 3- Global births versus the 75+ year old global population. As of 1950, there were two births for every 75+ year old person. As of 2018, the inverse is nearly true...as there are nearly two 75+ year olds for every birth. Because the global 15 to 44 year old population will remain essentially unchanged going forward, births will continue to be flat to lower while all population growth is among the 45+ year old population...most notably, the 75+ year olds. By 2050, there will be over five 75+ year olds per birth...and by 2100 and outlandish eleven 75+yr/olds per birth. Clearly, the time of population growth and the growth of the global consumer base has run its course. A system based on the growth of elderly, siphoning off the benefits of society, at the expense of the young is madness. On average, less than 10% of 75+yr/olds work, and they earn / spend about half of what they did in peak earning years. Yet, there is still unending talk of economic and financial asset growth and a seeming never ending willingness to offer the monetary and fiscal support to that end. Perhaps it's time we reconsider our notions that central bankers can conjure infinite economic and financial growth. It's time we reconsider where this is taking us, who this serves, and at what cost? It is time we seriously consider the alternatives!